I’ve been working on a blog post for ages about our green efforts and how my definition of progress opposes the generally accepted business definition. Today, though, I am writing something entirely different. Although I’ve been thinking about this for a long time, I’ve been too stubborn to put voice to it. And, my decision has been made even more difficult recently because the new flash cards have been extremely well-received with sales outpacing the old tins in the few stores where they’ve been available. Nonetheless, I’ve decided to end my adventures with mocobabies. It’s been almost eight years of amazing success building and growing my business. I have learned a lot, met amazing people, celebrated successes and improved after each mistake. I’ve reveled in the sense of accomplishment that comes from the strain of much hard work and, also, grumbled about the long hours. I’ve cherished the gift of time and flexibility that having my own business has given me with my children, while also stressing about never having enough time to get everything done. I’ve enjoyed tremendous support from family and friends while also working to not internalize negativity from those that have a different idea of success and assumed I just played on the computer all day. But, that is the brilliance of it – of anything in life, really – the trials and grumbles are what make you appreciate the successes, both big and small. I will always keep close the feeling of pride when the order finally came in from what would be my biggest retailer, a store I had been coveting for months; the emails and phone calls from customers telling me how much they loved my products; growing to the point where I could no longer manufacture the flash cards myself; meeting some of the most amazing, helpful and supportive people, and, most importantly, being able to share day-to-day moments with my kids that a 9-5 job wouldn’t have allowed me to be a part of. But, it’s time to say goodbye. My heart just isn’t in it anymore. I have had so many plans for mocobabies but, for lots of reasons, they have remained just ideas. It’s been these ideas though, along with my stubbornness and sentimentality, that have kept mocobabies going but since making the decision to close I feel like a weight has lifted. I can’t thank everyone who has supported me enough. I have an amazing family (parents who helped me cut and corner thousands of laminated flash cards), supportive friends, and THE most amazing customers. Thank you. Thank you. Thank you. 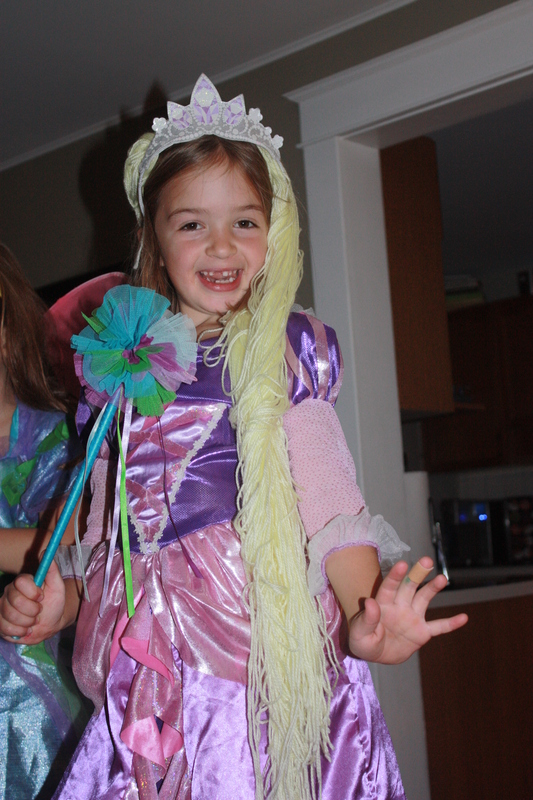 Last year Lily wanted to be Rapunzel for Hallowe’en. Fortunately there were plenty of Tangled costumes available, but none of them came with the trademark long blonde hair. No problem – a little yellow yarn and I’ve solved that problem. Except for one minor little detail: I am the least crafty person you will ever meet. But, with the best of intentions I pulled out my glue gun, bought yellow wool, a yellow headband and set to work. It wasn’t until the wee hours of the morning on October 30th that panic started to set in as I looked down at a mess of yellow and unsightly gobs of stringy glue along the top of the headband. I tried to fix it. I kept putting it on to see how the yarn was falling and how much more I would be able to add. It was awful. Lily was going to hate it. I was ruining her costume. She woke up full of excitement until I sat down beside her and explained that I’d really tried but I wasn’t sure she was going to like her wig. When I pulled it out from behind my back, there was silence. The pit in my stomach grew as I chastised myself for lacking even a shred of maternal Martha Stewartness. But, then Lily’s little face lit up and she grabbed it out of my hands to put on. She flung her new hair over her shoulder and twirled around the room. Oh, it looked awful but she was happy. I had forgotten that kids don’t have the same expectations of perfection that we do. And, frankly, I think Lily, in her youthful wisdom, knew it was going to be a tough road for me with my inability to pull off anything crafty. I’m not a fan of perfect and don’t often strive for it, but, sometimes I still get caught in its evil little trap. Lily’s headband has become my reminder to throw out perfectionism and just do what I can. It helps that a year later it’s still one of her favourite things in the dress-up bin. 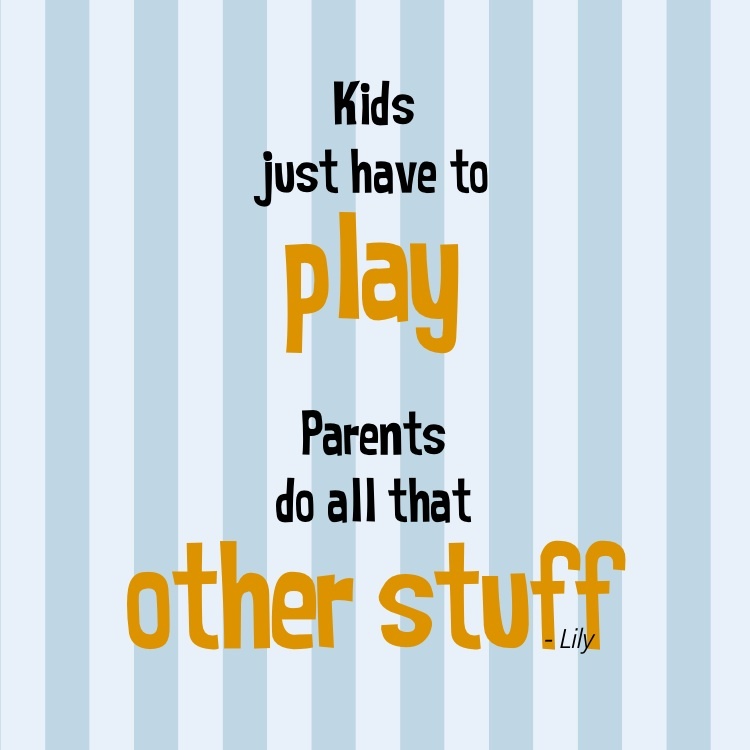 Nothing sets me on edge more than hearing one of my children bellow, “It’s NOT FAIR!” That one sentence can turn me foul even when in the midst of a sun-shiny-birds-singin’ kind of day. Lily thought it would be a good idea to whine it’s not fair when I asked her to pick up some of the ten thousand blankets she’d used to build a fort in the family room. “Mom, I have your Mother’s Day present in my backpack. I’m so excited. I think I have to give it to you now.” I knew it was pointless trying to talk him into waiting; he’s so much like his dad who bursts at the seams with excitement when he’s found, or made, the perfect gift. It’s pretty fun to watch, and, I like getting presents so I didn’t mind. Before I knew it, Jackson had placed a sweet painting and beaded necklace next to me on the front seat. “Do you love it, mom? Do you love it?” I did. Lily who had been patiently holding onto her gift for days yelled ‘I’M GIVING YOU MINE WHEN WE GET HOME!! 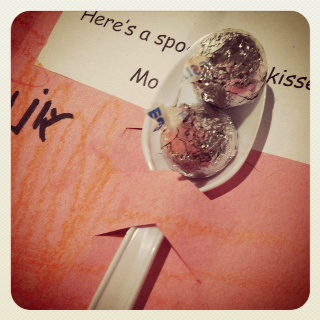 !” She ran upstairs and pulled the pink tissue paper wrapped “Spoon Full of Kisses” card from under her bed where she had been hiding it. I opened my arms thinking she was trying to give me a hug too but realized just in time that she was only trying to nab my chocolate kisses. Mother’s Day beats out my birthday for favourite occasions that are all about me. On Sunday, I might get to sleep in, I’ll definitely get breakfast made for me and we’ll all be together. We may not do anything much but on Sunday I’ll be spoiled with time, hugs and kisses. Truthfully though, as much as I love seeing the kids excitement giving me their gifts, I don’t hold out much hope that they will actually be able to give me the one thing that I’ve asked for this year: just one day of not having to referee their continual bickering. That, I think, may be asking too much. Happy Mother’s Day. I hope you get to enjoy a little pampering. This morning, once again, the kids were taking their sweet time getting ready. As I was trying to usher them out the door I noticed one still didn’t have their socks on, while the other was sulking about something left upstairs. A sweater was suddenly too small and their shoes felt like they had spiders in them. A new, and fairly odd, issue every second. At least they started to move while enjoying their quiet victory, sharing in whispered giggles. I smiled too, silently rehearsing a few new lines – apparently the old ones are too well worn. I love notebooks. I love the feeling of them and the potential the empty pages offer me. My intention is always to fill them with literary genius (I have lofty goals) but they end up filled with scribbles, untouched story ideas and little moments that I don’t want to forget. While cleaning my desk I found a few forgotten ones at the bottom of my drawer. I found a page, apparently written while in need of a little me time, full of dreams of my perfect day. Family struggles, pressures and mom guilt all wait patiently outside my bedroom door not making a sound, leaving plenty of room for my butler to come and go as required. I catch up on television shows, geared at an audience over seven years old, on a big screen TV that has magically appeared at the end of my bed. A steaming cup of coffee starts my day and my husband will deliver a pumpkin spice latte later in the afternoon (oh pumpkin spice, I love you). A gentle breeze sifts through the window screens, carrying just enough chill that I have to snuggle under the blankets to keep warm. The kids are close by ready to be called at my whimsy for hugs, giggles and cuddles while my husband is available for jaunty banter whenever boredom strikes. Before going to bed the night before her fifth birthday, Lily commented that her pajamas were still a little bit big, “…but I’ll be five in the morning, they’ll probably fit just right when I wake up.” My husband and I laughed while we exchanged a she’s-so-adorable-I-could-eat-her look. But, I swear Lily did seem just a little taller the next morning. We dropped Jackson off at school and headed to our favourite park for a special birthday walk. Watching Lily run ahead to find the perfect leaf for her bouquet of fallen autumn treasures, I thought my baby isn’t a baby anymore. There were trees towering over us, their leaves gold and crimson, as we played our way along the trail. Whenever there was a moment of silence I would ask, “How old are you today?” “Five! 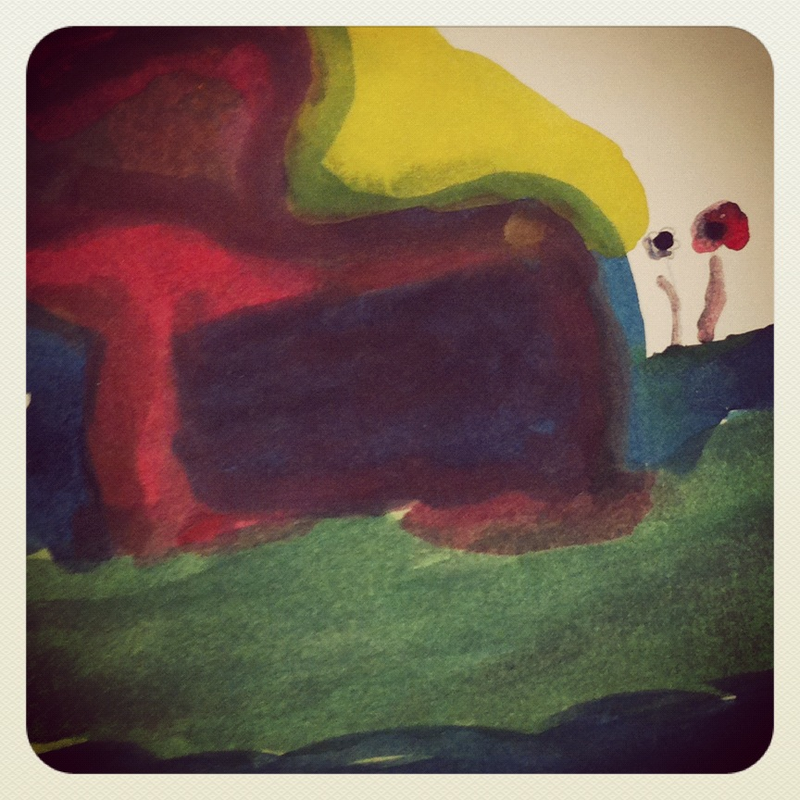 …Mom, am I five right now?” Without fail, she would ask if the moment had finally arrived as if wanting to know the precise moment she should feel different. Lily stopped in a clearing where the sun broke through the trees and bathed her in light. She stood still, looking skyward. I cursed myself for not having the camera to capture the serenity of the moment. I caught up and we both stood watching as the leaves made their descent, falling to the ground on the wind’s gentle wings. It was mesmerizing, like watching an intensely colourful slow motion rain-shower. Lily reached out and took my hand. I couldn’t help but smile. She may not be that tiny four pound baby that fell asleep on my chest five years ago, but, with her hand still so small in mine, I thought she’s still my baby.